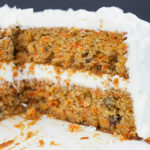 Best homemade carrot cake with whipped cream cheese frosting is to-die-for! Super moist, perfectly spiced, topped with amazing whipped cream cheese frosting. Preheat oven to 350 degrees. Line 2 9" round cake pans with parchment paper, spray with baking spray or butter and dust with flour, set aside. In a mixing bowl, whisk together flour, baking powder, baking soda, salt, cinnamon, nutmeg, and ginger. In a large mixing bowl, with an electric mixer, combine vegetable oil, applesauce, eggs, granulated sugar, and vanilla. Slowly stir in dry ingredients and mix until well blended. Stir in pecans and grated carrots. Divide mixture evenly into the 2 prepared cake pans. Bake cakes in the preheated oven for 40-45 minutes or until a toothpick inserted into the center comes out clean. Remove from oven and allow to cool 5 minutes in the pans before removing to a wire rack to cool. Allow the cakes to cool completely before frosting Flip cakes upside down when frosting. Chill a large bowl for the whipped cream. In a large chilled bowl, whip cream with a mixer until it forms stiff peaks. In another bowl, use a hand mixer to whip the cream cheese, sugar, salt, and vanilla until fully combined and creamy. Make sure the sugar has dissolved completely. Fold the cream cheese mixture into the whipped cream, then use mixer until it's fully combined and fluffy. **I use the food processor to grate the carrots and then I chop them up smaller. Faster than hand grating and you don't end up with long carrot strings in the cake.